Last week there were (at least) two interesting bird sightings at QUBS. On Bracken Tract Vicki Friesen’s “Conservation biology of birds” class found a yellow-breasted chat, Icteria virens, a large member of the wood warbler family (Parulidae). The species is broadly distributed in the USA but in eastern Canada is typically found in southwestern Ontario and Prince Edward County in eastern Ontario (see range maps here). 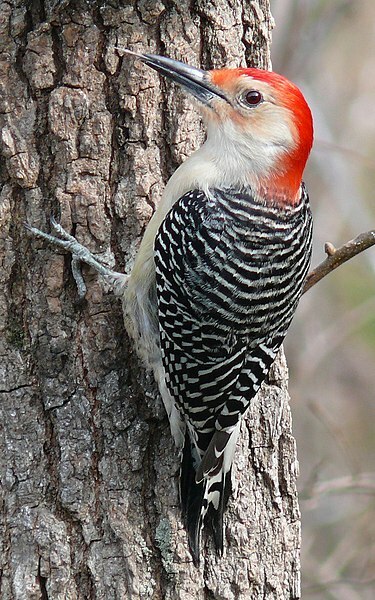 The second species of interest is the red-bellied woodpecker (Melanerpes carolinus), a species common in the southeastern USA but typically found in Carolinean Canada only. This particular individual was seen on the Lindsey Lake property (and actually bounced out of a mist net after responding to a playback tape). Red-bellied woodpeckers are reported ocassionally from upsate New York and from the Kingston area but is not particularly common here. In part this may because their call roughly resembles a gray treefrog (Hyla versicolor). The Ontario Bird Atlas presents a nice synopsis of this species. Check out this list of Ontario species of conservation concern from the Ministry of Natural Resources – provides a nice vantage on the wide range of species that are at risk in Ontario. The linked maps embed our region in the broader context of each species’ range in Ontario and globally. The status of these species is decided by the Committee on the Status of Species at Risk in Ontario (COSSARO). Welcome to our new natural history blog. We invite you to post interesting natural history observations, new distributional records for the biological station and environs, pleas for help on biological research, comments on posted articles, and notes on the cultural or geological history of Eastern Ontario. We also will invite new articles/species accounts to be written which we will post here.